Back in the dark ages I wrote a blog post on using Google Sign In to authorize a server from an Android client, and provided an accompanying gist with an example Activity in it. Recently, someone point out to me that gist was quite out of date, so I updated it to use the latest and greatest Google Sign In APIs on Android, with very pleasant results. The new version is much easier to understand, and only 2/3 the length of the previous one, without losing any functionality. That’s possible because of some of the features the Identity and Google Play Services teams at Google have added to Google Sign In, and to Google Play Services itself. Now, the only callback we have to worry about is the OnConnectionFailedListener. That tells us when there is a more serious problem (for example Google Play Services is missing or being upgraded) - we can’t do much with it other than disable any functionality that needs the service. Authentication used to be implicit in the GoogleApiClient connection - it would fail to connect until signed in if using an authenticated API. 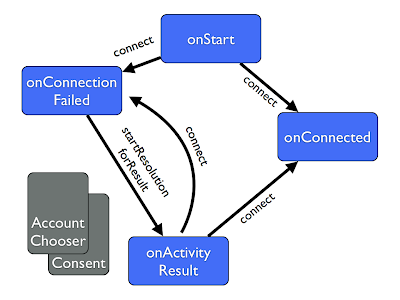 With the Google Sign In API, this changed - the authentication state and the connection state are separate, easier to manage options. Here we also see another newer feature of Google Play Services, the OptionalPendingResult. PendingResult is a class which effectively wraps a callback - its kind of like a promise - but OptionalPendingResult extends that idea to allow for results which may be cached in-process. if opr.isDone is true you have a result available synchronously, otherwise you can register a callback for an update. This is particularly convenient here - if the sign in state is cached locally, you can be signed it right away without having to worry about displaying a waiting prompt. If its not, Google Play Services may have to do a network round trip to check whether you have previously signed in to that app, so it probably worth displaying a lightweight spinner or greying out the sign in options until the result comes back. This means that once you get a successful GoogleSignInResult, you can fetch an authorization code from the GoogleSignInAccount associated with it. The gist from before has been updated but for the best introduction check out the complete Google Sign In Sample and documentation.